The Return of Oz | McQuillen Creative Group, Inc.
Video Production in Aberdeen, SD – Years ago, when I first came back to Aberdeen, I got involved in the newly formed Oz Festival. Me, my mom and my dad made costumes, props, signs, banners and all sorts of promo material. Then it ended. It was designed to be a cultural event that recognized the fact that Wonderful Wizard of Oz author, L. Frank Baum, lived in Aberdeen from 1889 to 1891. He did a lot while here and some scholars have made some very specific connections to Aberdeen and references in the Wizard of Oz book. They’re fun to ponder. Thanks to MGM, the movie, The Wizard of Oz, made drastic departures from the book adding different connotations and suggestions. 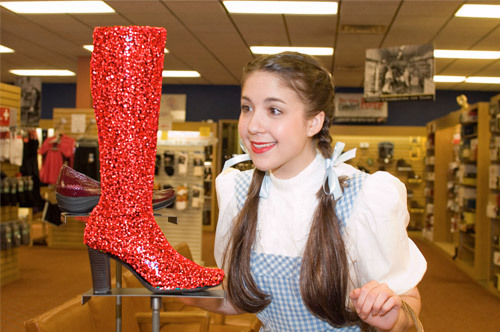 For one, Dorothy’s slippers were not ruby, nor were they red. They were silver and had no known powers. Dorothy was after the magic helmet for the wizard, not the broom of the Wicked chick. And, whom ever possessed the helmet, controlled the winged monkeys. MGM took extreme measures to make the yellow brick road really, really yellow. Many interpret it as being “gold-like.” At the time around 1899, yellow bricks were the most common brick available. In fact, Aberdeen had three yellow brick factories during Baum’s time here. Drive down the alleys of most historic downtowns and you’ll see a lot of common, yellow brick. They didn’t use it on the front facades, just the sides and back, which were rarely seen or a least weren’t meant to be appreciated. Me personally, I’m a traditionalist and have tried hard to preserve Baum’s literary intents with the book. But, the movie is just too powerful. IT is popular culture, not the book. So when we were tasked by Aberdeen’s city marketing committee to produce some TV commercials that featured Oz characters, we went to the movie for inspiration. We insisted that the costumes had to be top notch, not home made. With the help of rental companies and the Aberdeen Community Theatre, we pulled off some great make up and costumes. And here they are. So far, four have been produced. They are designed to be shown to a rural audience 100 miles from Aberdeen. Aberdeen relies heavily on the commerce from “daytrippers” who come here for gas, food, fun, doctors, and shopping. So that’s what we focused on.